I spent a full weekend testing pancake recipes, but they all tasted pretty much the same to me: good, but not exciting. Finally, I made these with sour cream, bananas, and vanilla, and — served with bananas and maple syrup — they were a hit. My husband, Jeffrey, who was my taste tester, loved them, but he had to take a long nap that afternoon! In a medium bowl, sift together the flour, sugar, baking powder, and salt. Whisk together the sour cream, milk, eggs, vanilla, and lemon zest. Add the wet ingredients to the dry ones, mixing only until combined. Melt 1 tablespoon of butter in a large skillet over medium-low heat until it bubbles. Ladle the pancake batter (using a ¼-cup measure) into the pan. 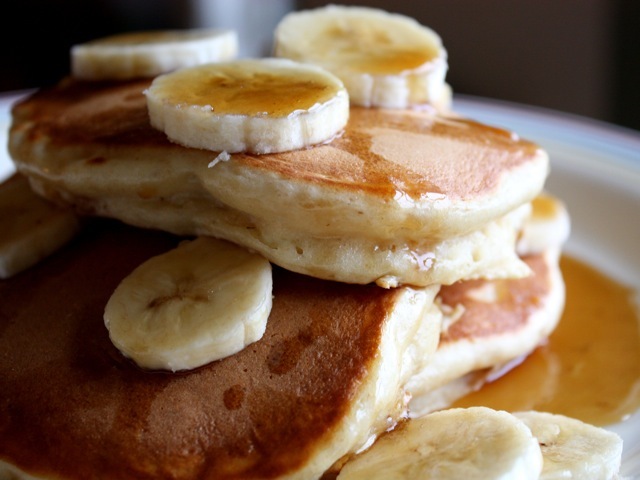 Distribute a rounded tablespoon of bananas on each pancake. Cook for 2 to 3 minutes, until bubbles appear on top and the underside is nicely browned. Wipe out the pan with a paper towel, add more butter to the pan, and continue cooking pancakes until all the batter is used. Serve with sliced bananas, butter, and maple syrup. The pancakes will stay warm in a preheated 200-degree oven for 15 to 20 minutes. Culinate editor's notes: If you don't have a fresh lemon on hand, used freshly grated nutmeg instead. And you may wish to cut back a bit on the sugar called for, especially as these thick pancakes will call for a lot of syrup. A scattering of diced nuts atop a pile of pancakes adds extra flavor and crunch, too.